People of London, hear my voice. It's been a rip-roaring rollercoaster of a year. Economic grimness, houses in Belgravia plummeting in value, the City in crisis, all sorts of terrible and ghastly things. But also a year of celebration. London elected a new Mayor for a start, and I got to wave a big flag in Beijing. So I'm throwing a big party down by the Thames tonight, and 180000 of you are invited. 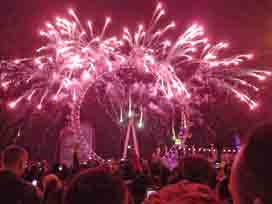 London's New Year fireworks are the envy of the world. Nowhere else are taxpayers herded prematurely into a waterside enclosure to stand for hours in the freezing cold waiting for ten minutes of flashy pyrotechnics. Nowhere else do annoyingly tall men in bobble hats stand directly in front of you drinking imitation champagne out of plastic cups and blocking your view of the pretty explosions. Nowhere else do citizens turn to one another at ten past midnight and say "Oh, was that it, I suppose we ought stumble home through this enormous crowd and watch it properly on the telly." You really wouldn't want to be anywhere else. At this point I must interrupt my speech for a message from this year's sponsors. "New Year's Eve is a moment of optimism - when people forget the troubles of last year and celebrate the next. Now more than ever it is important to focus on the positive things in life. Put simply Life's Good on New Years Eve." I thought it would be good to have a sponsor this year because big fireworks are terribly expensive. So I asked a fridge manufacturer to give us lots of cash, and in return I'm allowing them to write patronising PR drivel on websites, and plaster their logo across the Embankment, and give out thousands of branded hats in the hope that gullible members of the public will still be wearing them on the train home. Now where's the harm in that? It also saves me having to charge £10 a ticket for spectators (although, hmmm, maybe next year). Oh, and for the first minute of the display all the fireworks will be red and white, because those are the LG colours, but in no way has this compromised the artistic integrity of the event. "We will be using LG technology to significantly enhance the experience on the night and ensure that London's New Year celebrations become a global talking point. Our sponsorship of the fireworks is aimed at building a greater emotional connection to the LG brand globally as millions of eyes watch the capital celebrate the strike of twelve. It comes hot on the heels of LG's other recent sponsorships in the UK, all of which are helping to move the brand from being purely a product-driven organisation to one that brings memorable experiences to consumer's lives." And there's one other big change this year. I introduced a new byelaw back in June which bans the drinking of alcohol on public transport, and yes, it still applies tonight. We must feel safe in our capital, and that means nanny knows best. I know under Old Ken things were different. I know swilling down cans of lager on Hogmanay tubes used to be commonplace. I know getting blotto on the bus was once an integral part of everybody's New Year's Eve preparations. I know late night trains on December 31st used to resemble pubs on wheels. 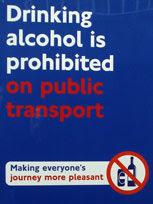 But cease your beery singing, because it isn't happy hour on public transport tonight. Now I like a drink as much as the next man, especially if the next man is the great Roman emperor Pistus Fartus. But it's important to be a responsible citizen this New Year's Eve and not to make our tube carriages a den of vice. By all means get blind drunk before you come up to town. By all means leave a trail of vomit from the bus stop to the tube platform. 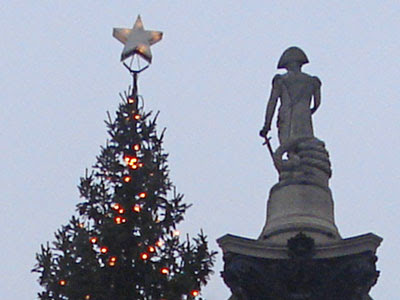 By all means bring a bottle of bubbly to enjoy in Trafalgar Square when you arrive. But whatever you do don't crack open a six pack on the Circle line and proceed to pour the contents down your throat, because that's now very naughty indeed. Oh, and I'd be much obliged if you lot could police this alcohol ban amongst yourselves tonight. All the police are going to be extremely busy sniffing for knives in town, and our transport workers have more sense than to confront hordes of drunken yobs on New Year's Eve. Let's keep it dry out there, lest LG's firework sponsorship be tarnished by alcoholic impropriety. Together we can make the end of 2008 just that little bit less enjoyable. And let's see in 2009 with a value-for-money bang. 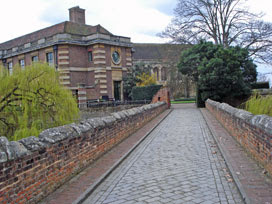 1) Eltham Palace: Oh my word, the Courtauld's suburban hybrid of Art Deco and the medieval is an utter delight. Do go. 3) Rotherhithe Tunnel: You have to be mad to walk through this exhaust-fumed roadway (so I indulged in a bit of centenary madness). 4) Linked: An audio walk alongside the M11 link road, from Wanstead to Leyton, remembering the everyday stories that were buried beneath. Have you been yet? 7) Beijing Torch Relay: What an unmitigated disaster, from the hordes of overzealous flame protectors to the dismal no-show outside my house. Never again. 8) A ride on the last unpainted "silver" tube train: Farewell to maple-floored carriages, and farewell to those dangling bobbly plastic grippy things. 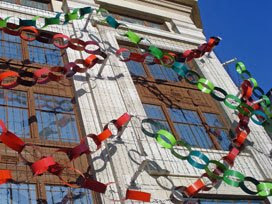 9) Museum of Domestic Design & Architecture: A charming mini-museum of homely creations, just outside Cockfosters. Runners up) New Year fireworks, Waterworks Nature Reserve, Queen Elizabeth's Hunting Lodge, Silvertown parks, Arsenal, RAF Museum, 43 bus, Kray country, independent bookshops, Regents Canal, Upminster Windmill, Ronan Point, City Hall, Telectroscope, 135 bus, Oriental City, Beverley Brook Walk, Westminster Abbey, Tobacco Dock, Trinity Buoy Wharf, Fairlop Fair, HMS Belfast, Whitechapel Bell Foundry, London Open House 2008, Shepherd's Bush stations, Landskip, Westfield, 16 bus, Hoxton Street, East London Woolworths, St John's Gate. Random boroughs: Brent, Redbridge, Ealing, Harrow. 3) Rye: A south coast jewel, a cobbled timewarp hilltop, a place of beauty and refinement, and too easily overlooked. 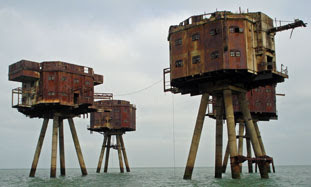 5) Tilbury: Take a walk along the grey northern banks of the Thames estuary from one historic sea fort to another. I picked perfect weather and basked in the industrial isolation. 6) Isle of Wight: How about a day trip to England's largest island, including a ride (in Ryde) down the pier on a tube train? 8) Coventry: Two historic cathedrals, ooh lovely, and a fascinating motor museum. 9) Box Hill: The southeast's favourite climb, rising up from a biker's takeaway to a National Trust restaurant. 10) Chartwell: Churchill's charming Wealden home, at the end of London's most southeasterly bus route. Runners up: Southend, Henley, the Otford Solar System, Norwich elephants, Oxford, Milton Keynes. Ten other favourite posts from 2008: 1996, Amy Winehouse, steam, Eggstreme Early Easter, dharma geezer, commenting competencies, Londo, next train indicators, remembrance, redundancy. » (Tuesday) » Museum in Docklands: Rare amongst London museums because it costs money to get in, which is probably why you haven't been. But this Christmas the entire place is free to enter, at least until next Sunday, so this might be a great time to finally go. » (Wednesday) » New Year Fireworks: If you enjoy standing like sardines for hours, then watching featureless pink smoke drifting towards you for ten minutes, then battling your way home through hordes of drunken revellers until you finally find a tube station that's still open, head for the Embankment around 10pm. Me, I'm giving it a miss this year. » (Friday) » Late at Tate: Where to go on a post-hangover Friday? Maybe to Tate Britain for their "first Friday" event, which this month features a bit of an artistic hotchpotch including zinesters Savage Messiah, synthpopsters Petit Mal and a selection of award winning contemporary films from Romania. Or go down the pub and get drunk again. » (Sunday) » Geffrye Museum: Sunday's the last day to see the museum's period rooms decked out in all their traditional Christmas finery. And then on Twelfth Night (Tuesday) there's the annual burning of the holly and the ivy accompanied by carols, mulled wine and cake. 1) Cut Copy - In Ghost Colours: Because everybody needs a favourite obscure band nobody else loves, and mine's from Melbourne. You might try sampling Lights and Music as an introduction to their catchy electronica, or maybe Feel The Love (but I'd rather you didn't, and I kept their marvellousness exclusively to myself). I think my heart's still in 1981. 2) Neon Neon - Stainless Style: An 80s style DeLorean-themed concept album from one of the Super Furry Animals - it so shouldn't work, but so does. And should've won the Mercury. 3) Hot Chip - Made In The Dark: As soon as bouncy chugging Ready For The Floor was released back in January, I knew this catchy little album was going to be a 2008 favourite. 5) The Streets - Everything is Borrowed: Not Mikey's best, but definitely heading back in the right direction. A retail behemoth enters its dying phase. 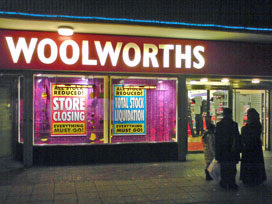 The first tranche of Woolworths closed down yesterday (farewell Bedford, Braintree and Bognor Regis), another batch go on Monday, more on Tuesday, a penultimate phase on Friday and the final nail in the coffin on Monday 5th January. As closedown approaches, watch the bargains deepen. From 50% off to 70%, 80%, even 90%, all stock must go. Fancy buying your shopping basket? That'll be another quid, thanks. That clothes rail's going too if you want it. But the girl behind the till, sorry, she's walking out of the door for nothing. The Woolworths in Norwich used to be huge. You know the one, sandwiched between Stadium Delia and the station, just off the inner ring road. It opened ten or so years ago as "The Big W", Woolworth's attempt to break into out-of-town pile-it-high warehouse shopping. Local people flocked to spend their boomtime cash in this vast cathedral-sized space, and it could take a good half hour to get round from one side to the other. The toy section had everything a child could want, and homewares stretched as far as the eye could see. Even Roys of Wroxham had nothing on this place. Alas, the good times couldn't last. It's only half a Big W now, with one end sold off to Curry's to flog flat screen TVs and laptops. 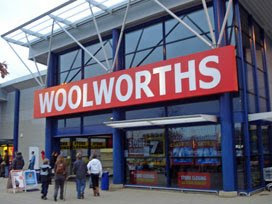 Woolworths has clung on to the dingier half, not quite so well heated, and not a laptop in sight. Several aisles are boarded off, and a sign apologises that the toilets are shut now that the in-store cafe has closed down. It's not a welcoming sight, but there are still massive bargains to be had if you happen to want the motley assortment of goods they've got left. In particular, toasters and ironing boards. 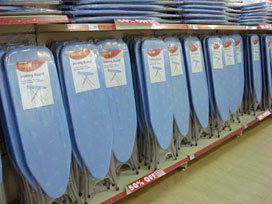 There are still racks and racks of plain blue ironing boards to be snapped up. Nobody wanted them at £8, and even at half price they're hardly flying out of the door. Wait until Friday, however, and you might well get one for under a quid. Not that you need a new ironing board, obviously, but at those prices it would be a shame not to. And toasters too, very ordinary white toasters, very own brand, very Woolworths. Again they're hardly a necessity, but if you have any children who might be heading to university in the next 15 years it'd be criminal not to buy one for them. The toy department was a pale shadow of its former glories. A few colouring books, some stickers, various Doctor Who action figures from less popular episodes, that sort of thing. Over in homewares just the last dregs remained - assorted crockery, plastic coathangers and an awful lot of WorthIt J-cloths. On one forlorn shelf I spotted the lemon squeezer I'd bought last month for £2 now down to just a quid (and soon, I suspect, to be even cheaper than a single lemon). There was rather more interest from the public in the entertainment section at the rear of the store. Mass produced mainstream CDs for a few pounds, unwanted books for less, and an assortment of computer games now reduced low enough to keep several teenagers happy. I took the opportunity to stock up on a few more of life's essentials at rock bottom prices. A couple of plastic luggage tags for £1.24, a proper metal tape measure for 37p, twenty plastic wallets for £1.18, and six rolls of sticky tape for 49p. Sure it'll be possible to buy similar stuff in the High Street after next week, but no doubt tackier imports and not of equivalent value. I was even persuaded that what I really really need in my kitchen is one of those drawstring bags that holds scrunched up carrier bags, because at 26p it was almost as cheap as not buying one. I felt like a vulture picking the last scraps of fresh meat off a freshly dead carcass (but I tried not to show this in my eyes when I queued up at the till on the way out). "7 days" proclaimed the sign in the front window yesterday, you have seven days to strip us dry. But I suspect there'll not be much left by Friday, just a few Daniel O'Donnell CDs, a selection of green check Ladybird dresses (age 7-8) and the unquenchable Pic'n'Mix. It's not how the place would like to be remembered. Come in store number 1247, your time is up. Thank you for my present. It was very kind of you to buy me a book that I did not want. I only received three presents exactly the same. What were you thinking of, you stupid old witch. Do you not read my Facebook profile? I've got all my likes and dislikes listed on there and "books" do not appear. Nobody my age reads books any more. I even opened your present in front of my friend Dan because I thought it was going to be a well wicked computer game, but it was only a stupid book. Now Dan will tell everyone at school I got a book for Christmas and I will be homphobically bullied for months. I hate you I hate you. Daddy says I have to thank you for letting us come round for tea on Boxing Day. God knows why because your cooking is pants. Your sandwiches tasted like cardboard and your Christmas cake was well sick. When I'm older I will sue you for making me fat and lardy, and it'll all be the fault of that extra slice of stodgy fruitcake you forcefed me. Why did we have to play Monopoly all afternoon? Monopoly is the most boring game in the entire world, except perhaps for charades (which is maybe why we played that next). Do you not have a games console in your house? We have six. Daddy says that some old people never had games consoles when they were young and they had to make their own entertainment like collecting stamps or whittling twigs or even reading books. And there wasn't even the internet either. No wonder you're a bit screwed up. I cannot believe you made us watch television. TV is for old people and for saddoes. I did not want to watch the bloody Narnia film. It is not 'family viewing' (or whatever you called it), it is a lot of posh kids talking to lions and it is for babies. I watched it at Dan's when I was about six, and it was rubbish then. At least his house didn't smell of lavender and rich tea biscuits. Yours does. Next year please text me in advance and we can avoid any embarrassing scenes. You could even buy me something I actually want. A knife would be good. Daddy won't let me have one, but I'm sure you're more reasonable. In fact I bet you used to have one when you were little, so why can't I? I promise I'll only use it for whittling. And next year, please do not kiss me. Not like ever. Christmas is a time of disappointment. Sending out 60 Christmas cards, but only getting 20 back. Receiving a card from someone you decided not to send to this year because they forgot last year. Discovering which song Simon Cowell plans to hijack the Christmas charts with this year. Ringing around for a must-have present that isn't in stock. Waiting at home all day for a delivery that never appears. Traipsing the shops in vain looking for nothing in particular. Buying presents even when you know the recipients won't like them. Trying to wrap something that isn't cuboid shaped, and making a mess. Wrapping two CDs as presents, then going to write the label and forgetting which is which. Arriving at your destination and discovering you left a bag of presents back home. Meeting up with family and remembering you ought to visit them more often. Remembering everyone who was here last Christmas but isn't here this Christmas. First discovering that Santa lives closer to home than you were led to believe. Trying very hard to stay awake, but falling asleep before Santa arrives. Being woken at 4am on Christmas morning by a loud text message greeting. Being woken at 5am on Christmas morning by a bouncy overexcited toddler. Being woken at 6am on Christmas morning by the onset of 48 hour flu. Hoping for snow, and pulling back the curtains to drizzle. Opening a gift you didn't want, and trying not to let on. Opening a gift expecting it to be one thing, and finding it's another. Realising that the present somebody else bought you cost ten times what you bought them. Realising that the present you bought somebody else cost ten times what they bought you. Realising that your most special present won't work until the batteries are charged, probably tomorrow. Discovering that the turkey won't be fully cooked for, damn, another three hours. Scoffing countless seasonal foodstuffs in the full knowledge that they're very bad for you. Serving up sprouts on everyone's plate "because it's Christmas". Opening the box of Quality Street to find only green triangles. Opening the fridge to find three more days of turkey leftovers. Buying lots and lots of food before Christmas, but throwing half of it away afterwards. Being forced to watch Emmerdale rather than Doctor Who. Getting home after Christmas to discover that none of your favourite programmes recorded. Checking your credit card balance on December 31st, then panicking. And Christmas is also a time of hope. Or just put your diet on hold until New Year (and then starve yourself throughout January). Sorry, I'm asleep at the moment. I thought I'd have a lie in this morning because I'm not at work today. I didn't see the point of going into the office for three lifeless days in the run up to Christmas. The last two days of the week are bank holidays, rather special ones, and I'll be elsewhere gorging on sprouts and turkey. Then next week the office is closed so I couldn't go in even if I wanted to. Which means that I appear to have an entire complete fortnight off work, starting now. Which is why I'm still asleep. Sorry, you're obviously not. Maybe you're one of the poor sods who has to go into the office this week. Perhaps you've been given a Christmas Eve deadline by some evil project manager, so there's no escape right up until Wednesday afternoon. Perhaps you've run out of leave entitlement for this year, so you're trapped at your desk no matter what. Perhaps you just like going in when it's quiet, because that way you get paid to surf the internet and look out of the window while nobody's looking. Whatever, I'm sorry, I've got a fortnight off and you haven't. Still, at least you might get most of next week off. Maybe you don't work in an office at all. Maybe you'll be selling stuff in a shop today, hoping desperately that members of the public actually turn up and give you money. Maybe you work in banking instead, hoping desperately that members of the public go away and stop asking you for money because you haven't got any. Maybe you work in public transport, or in a restaurant, or on the dustcart, or delivering the post, and are busy counting the days until Christmas Eve. Whatever, I'm sorry, I've got a fortnight off and you haven't. Still, at least you might get a couple of days off later this week. Or you might be one of the sterling public servants who work through Christmas to make sure the rest of us can enjoy ourselves. Possibly you keep the electricity going, or the gas flowing, or the water running, so that the rest of us can cook and flush and Wii. Possibly you work on a farm or in a care home, because growth and decline don't pause just because it's Christmas. Possibly you keep the health service afloat, so that hypochondriacs with manflu can ring 999 and waste the resources of a nation. Possibly you're a TV announcer, or a vicar, or the cleaner in a hotel, or some other profession that doesn't shut down for a festive break. Whatever, the rest of us are really extremely appreciative of your self-sacrifice. Still, at least you might get a quick nap between shifts sometime on Thursday if you're lucky. Or maybe you don't work at all. If you're retired then a mere fortnight off is nothing special. If you're still at university then your break is probably twice as long as that. But if you have the misfortune to be unemployed then the coming two weeks probably look like more of the same, just hugely more expensive. It's a grim time of year to be struggling, and it's a grim time for more folk than usual this year. So look, I'm doubly apologetic. I'm getting paid a salary for the next fortnight even though I'm doing bugger all productive, and you're surviving on nothing much and grafting hard in an attempt to celebrate Christmas as tolerably as possible. I love my fortnight off. Sorry. I may even wake up soon. Just what's needed at a time of economic depression - a free exhibition about small change. You must have found some of these shiny new coins in your pocket by now, assuming you still buy things using cash and haven't completely defected to the plastic side. You might have wondered what they were, or even tried handing them back to the shopkeeper thinking they were foreign. I've not quite collected the full set yet, I'm still missing the 50p, and then I'll be able to twiddle around with the coins as the designer intended. Like this. 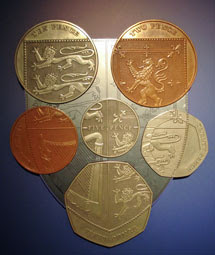 Here's Matt Dent's grand coinage concept, enlarged to wall-mounted size with a notice underneath saying "Please touch". 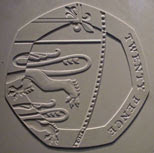 This tactile model shows precisely how the new bronze and silver coins were carved out from the historic Royal Arms. The 50p at the pointy bottom of the shield, the tiny fivepence crammed into the middle, and the big ten and two in the top corners. It seems this symmetrical arrangement wasn't quite Matt's original plan. The exhibition also contains his first paper draft, with six circular holes cut out to deliberately highlight the most interesting parts of the Arms. But no, much better to fit the coins closer together and to see what random images they contain. Matt moved over to his Mac to tweak 25 slightly different arrangements, again displayed here, before submitting just one to the Royal Mint Advisory Committee. Success. There are many stages from drawing board to pocket. A large plaster model is created, about a foot across, so that the intricacies of the design can be finalised. 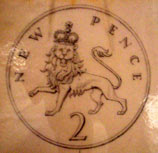 Here's the 20p version, featuring the rear end of a lion passant. This is then shrunk down to a real-size die stamp, shiny and perfect in every way, and the coin-to-be is slammed hard between the logo and the latest version of the Queen's head. It's all done with machines, millions of times, somewhere in South Wales, before being shipped out to banks and shops and businesses. And that's how Matt's most original concept went forward to grace the nation's purses and wallets for the foreseeable future. No numerals on the tails face, though, so visiting tourists had better learn our language fast. Also on show at the exhibition are the designs from the last time our coinage was updated, way back in 1971 for decimalisation. The designer was Christopher Ironside and he had to go through the process once in secret and then again in a public competition. Christopher put forward four different sets of linked designs, each featuring a selection of iconic images, but none of them quite the combination we see today. A futuristic gyroscope on the 2p (er, no thanks). A thistle on the 5p (yes, fine). A sailing ship on the 1p (too old school) and Britannia on a circular 20p (doubly wrong). All the old favourites are there somewhere, though, lovingly sketched on thin paper as designers had to in the 60s before computers made life simple. It's not a big exhibition, little more than a handful of display cases in a tiny cell-like chamber. You'd be hard pushed to find it if you didn't know it was there, up on the third floor beyond a room full of Greek and Roman relics. Everybody I saw stumbling upon it yesterday appeared to be a foreign visitor, and all of them quickly deduced that this was a very British very modern exhibition and disappeared back out to their favoured classical antiquities pretty sharpish. But you might find it more fascinating, especially if you're interested in the evolution of good design, or if you just want to know where the art gallery in your pocket originated. Many thanks to Martin, who's post yesterday first alerted me to Designing Change's existence. His report also contains far more photos than mine, so do take a look if the subject's of interest. But, sigh, the exhibition has already been running for three months and not a whisper of it had come my way before. Either I'm slipping or the British Museum's publicity department is obsessed solely by Babylon and statues. You have just over two more months to take a look yourself. It's that special time of year again, where I waste a day of my annual leave entitlement in retail hell. 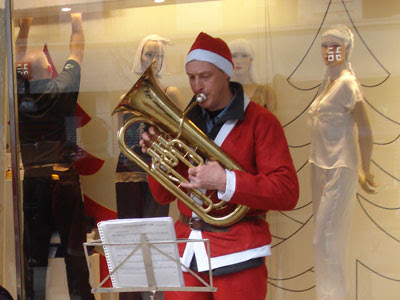 At least pre-Christmas Friday morning on Oxford Street isn't too nightmarish. I can wander from shop to shop relatively unhindered without being hemmed in by the bag-carrying hordes. All looks fairly normal - traffic jams, scaffolding, dull Christmas lights, buskers in Santa hats - apart from one thing... the sales! Not every shop has a sale, of course, but in any normal non-recessional year surely there'd be none. So why venture into a full price department store, not when there's a bargain basement chain store just across the road? BHS appears to have given up all hope of selling festive novelties and is flogging the lot off at half price. I'm easily tempted inside a shoe shop where 50% off appears to be the norm. The shop's interior already looks like it's January, with stacks of genuinely bargain cut-price footwear up for grabs, while a few hardline brands lurk at full whack in one corner only. I'm almost tempted, but move on unshod. The pavement clears, and a smiling lady in a red tabard turns her gaze upon me. Oh bugger, I'm about to be chugged. Normally I'd be safely protected by my headphones, but the power's failed and I've made the fatal mistake of removing them. So I attempt to shoot her my best "piss off, curl up and die" face in the hope that she'll turn away and bother some other poor sod instead. No such luck. I frown a little more convincingly. She edges towards me with a beaming grin. Grrr. I was perfectly happy until she turned up. But with just two ill-chosen words my mood darkens and an inner gloom descends. Oh for goodness sake who do you think you are you patronising uncharitable scum? How dare you lecture me on my state of mind when you know absolutely nothing about it? I know it's your job to wheedle your way into conversation with strangers and thereby extract direct debit promises from the guilty and the gullible. But did your training really suggest kicking off with a tactless faux pas which serves only to demoralise your intended victim? I feel the urge to spit in her face or punch her in the stomach, but thousands of years of evolution prevent me. Damn, that really wasn't insulting enough. I should have let rip with a four-letter riposte and told her what I really think, but my mouth retreated before my brain could speak. I should have told her to mind her own business, or to take lessons in positive customer engagement, or just to piss off, curl up and die. I should have vowed never to give another penny to the international charity she purports to represent, because ultimately her coin-shaking assault was their responsibility. Instead I walk swiftly past, inwardly huffing, every scrap of Christmas spirit instantly dissipated. And she turns to approach another innocent shopper with some alternative fixed-grin opening gambit. Cow. Thankfully my inner smile returns a few minutes later, the incident overshadowed by a few bars of Jona Lewie pumping out onto the pavement from an empty clothes shop. And I continue to wander around shop after shop after shop, staring at all the unnecessary over-priced trifles, and buying nothing. Some time next week I'll probably return and stare at exactly the same festive fluff again, except this time I'll buy some of it out of sheer desperation. Because the only thing worse than buying a disappointing Christmas present is buying no Christmas present at all. Thank goodness everything's half price this year. Seven months after coming to power, Mayor Boris has made good his pledge to find a replacement for the Routemaster. His New Bus For London design competition has been hugely successful, attracting hundreds of entries from top architects and ordinary members of the public. BoJo's inner circle of advisors has scrutinised the suggestions to see which they like best, and today the chosen design can finally be unveiled. And here it is! Magnificent, isn't it? It embodies everything that was great about the old Routemaster but with a firmly post-retro twist. It looks like it's straight out of a Sixties toy cupboard, which makes it extremely lovable and nostalgic. It has a knobbly roof. It doesn't bend in the middle. And it's red. 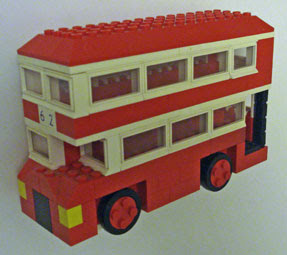 It's the "People's Bus", sent in by 8-year-old Rupert de Vries-Hoffman from Bromley. Young Rupert was encouraged to enter the competition by his father, who's a local councillor, and created this stunning design in just half an hour using plastic Lego bricks. A well deserved winner, I'm sure you'll agree. And now this lovely omnibus is going to be manufactured and reproduced hundreds of times over, before being rushed out onto the streets just in time for the next Mayoral Election. » Rear platform: A must-have. In Boris's new car-friendly capital, it's essential to be able to jump off the back when the bus gets stuck in snarled-up traffic. » Grab pole: Perfect for tying a wheelchair to. Oh yes, this new bus is fully accessible. » Conductor: A jovial clippie in a bright blue uniform, whose job it'll be to herd passengers down inside the bus and to tell teenage girls to take their feet off the seats. » On-board announcements: These will be in Latin. Obviously. » First class saloon: To increase profitability, customers wishing to use the luxury non-plastic seats on the upper deck will have to pay extra. » Soundproof cell: Under the stairs, for locking up disrespectful kids who insist on blaring tinny R&B from their mobiles. » Reserved seats for pensioners: Just inside the door, lovely, with a space for your shopping, nice. » Special segregated area for pushchairs: Buses serving Dulwich will also include nappy-changing facilities. » Live screening of security camera footage: "Look at him, he's picking his nose, and she hasn't washed her hair properly, and he's got an iPod worth nicking, let's mug him when he gets off." » Drinks machine: Swipe with your Oyster for cappucinos, hot chocolates and a liquid resembling tea. » Sealed-shut windows: Sorry, we know summertime ventilation is important, but we can't risk vandals throwing cappucinos out of the top deck windows onto innocent passers by. » Drug and knife detector: Every bus will have a fibreglass sniffer dog located near the entrance to deter crime and make Londoners feel safer. » Inward-facing exhaust pipe: To reduce carbon emissions, this bus belches its fumes inside instead. Today's winning design will one day become a much-loved icon of London, replacing the evil cyclist-crushing bendy bus, and tourists will flock from all around the world to ride it. Londoners will once again have confidence in their elected officials, safe in the knowledge that their hard earned taxes aren't being wasted on pointless vanity projects. And residents in the Outer London suburbs will be able to say "Look, there goes Boris's new Routemaster, it's great to have this noble beast back on our streets again, now hop into the car darling and let's drive down to the shops." It's a proud day to be a Londoner and no mistake.  Yes, inspired by comments to yesterday's post, thanks.  Yes, I know I've probably made several mistakes, please point them out.  Yes, I know I've probably omitted several stores, feel free to suggest more.  These are the ones I remember, so your suggestions may not appear.  I've updated the list three times so far, any more thoughts?  I will confess to finding this forum thread very useful.  Expect this list to get longer in 2009, alas. Three weeks since my last visit, and it's all change at my almost local Woolworths. Last time the shelves were full and the aisles were empty. Now it's the other way round. The store is closing, the merchandise is being liquidated, and the local population has been through the store like a plague of semi-efficient locusts. Buy now while stocks last. There's no security guard at the entrance any more, which says a lot about the quality of the goods remaining inside. Shelves of sweets, especially of the foamy sugary Haribo kind, are still particularly well represented. Will nobody buy the 20 boxes of mint green Mingles stacked opposite the checkout? 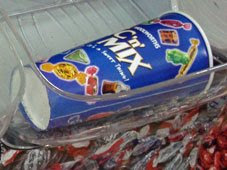 And don't worry, because further inside there's still a plastic rack of multi-coloured pic'n'mix. I suspect these scooped candies are a bit like the ravens at the Tower of London - when they've vanished, all is truly lost. The toy section's looking a little depleted. There's still plenty here to fill Santa's sack, but nothing any self-respecting kid would have written on their Christmas list. One aisle is already empty, taped off to prevent further disturbance. Close by is what's left of children's clothes. This aisle looks like a tornado's swept through it, with blouses and coats and tiny plastic wellingtons scattered haphazardly across the floor, intermingled with discarded cards from a single pack of Doctor Who Top Trumps. Look carefully, there might be something left in your toddler's size. Homeware, now a far more eclectic mix than usual. Don't come looking for Pyrex or toasters, the decent stuff's long gone. But if it's something of the order of a pair of scissors or a novelty penguin mug you need, then you might still be in luck. Certain colours of paint are available, but not many, and the haberdashery section is not yet fully diminished. In the stationery department a mute store worker busies himself restacking the shelves. It seems there are plenty more notepads in the storeroom out the back, and an awful lot of packs of economy biros, but just the one book of raffle tickets. Groups of local youths wander in and out, maybe searching for a bargain Wii game (all gone) or perhaps just hoping to shoplift a DVD before the doors close. A weary assistant returns an opened tin of Jelly Babies to the front desk - someone's helped themselves to a handful and the remaining sugar offspring must now be condemned to destruction. Two veiled ladies pick through the assorted remnants on a shelf of entertainment leftovers. Something here will do the kids for Christmas, not that they celebrate it, but you have to buy something don't you? And on every shelf is a big red percentage mark-down, be it ten or twenty or 30% off. There's a helpful table underneath for those who can't work out what 20% is ("was £1, now 80p" "was £2, now £1.60"). Very little is priced at the maximum half price discount, just greetings cards and school clothes you'd never have dreamed of buying anyway. Signs everywhere warn "No Refunds, Exchanges only". The chain's wholesale buyer misjudged the local population when they purchased umpteen black laptop bags - no amount of downpricing will shift these. But nobody needs to leave empty handed, this is still a store filled with useful bits. For now. I head to the snaking queue at the checkout, weaving my way through a canyon of under-a-quid sweet packets. I am conspicuously the most well-off person in the queue, and also one of only four white faces in the store. Three mixed-race schoolgirls stand together in front of the till, their hair in frizzy bunches, and with tasseled boots sticking out from beneath off-black leggings. As formulaic R&B plays over the in-store loudspeakers, they jiggle and sway and mime along to the lyrics. The assistant drops their pile of chocolate-based purchases into a bag, and takes their pennies, and eventually they move on. I hand over my purchase selection to the nearly-redundant bloke at the till. I'm buying 80 large envelopes and some shoelaces and a roll of brown paper, because you never know when you're going to need brown paper and in the future you'll never know where to get it. I offer a twenty pound note from my wallet, and am pleased to be given more than fifteen back. I sigh at the message printed at the bottom of my receipt: "Avoid Jan Sale queues, Xmas returns can be accepted from Monday 29th Dec". Somehow I'm not convinced this store will last that long. But there are still some real bargains to be had here, and I fear that whoever takes over this shell of a building in 2009 won't sell any of them. I wonder who'll be next? There's nothing quite like Old Moore's Almanack. It's jam packed with horoscopes, dodgy adverts and superstitious tosh. If you want to know the highs and lows of the Saggitarian year or check your lucky lottery numbers or discover what the stars hold in store for Noel Edmonds, it's the publication for you. And who could resist the bonkers adverts for postal witchcraft, spriritual silver talismans and lucky Cornish piskeys? I like Old Moore especially for the 12 pages of astronomical information in the middle - high tides, phases of the moon, famous anniversaries, that sort of thing. Before the internet came along there was no easy way of finding out this sort of thing, and a quid or two was small price to pay for horological peace of mind. The almanac's been published every year since 1697 (I don't think celebrity astro-profiles featured in the first issue) and I own a copy of every edition since at least 1990. Except for 2009. Old Moore's Almanack is published in midsummer each year, and normally I spot a copy in a shop soon after publication. In a box beside the till in Smiths in Stratford or lying on a shelf in some godforsaken provincial bookshop. But not this year. I've not seen a copy anywhere, not for six months, so I wondered whether the publication had finally gone bust. Aha no, there it is on Foulsham's website, which opens up the online purchase option I've had to use once before. And all for a totally reasonable £2.20 plus 33p postage and packing. Add to basket, go to checkout, type in personal details and card number... and click on "Make Payment". Oh bugger, Verified by Visa. Now, what is it that banks are always telling us? Never (repeat NEVER) enter your personal details on a suspicious website. And what am I starting at? A big white screen with a small amateurish frame in the middle, like some web designers idea of cutting edge page layout 2001 style. Distinctly suspect. There's also a completely different web address to the site I was originally on. I appear to have been transported to www.securesuite.co.uk (which, if I was an online crime spammer, is precisely the sort of fake URL I might select). Questionable, most definitely. The text on the screen isn't much more reassuring. "Simply complete the details below to activate this free security service." Precisely what a viral phishing site might say. And then space to enter all my most secret financial information. Call me paranoid, but there is absolutely no way I'm going to sign up to this supposed service mid-transaction. £2.53 unspent. Payment fail. My bank hasn't yet thought fit to warn me about any of this in any official communication, which is one reason I'm a little apprehensive. But, as I understand it, Verified by Visa is an opt-in service designed to improve online security. Its watchwords are reassurance and trust. Once I've signed up to V-by-V, every online transaction will be one stage longer, demanding yet another password at the crucial purchasing moment just to delay things a little. It'll stop evil restaurant waiters from scratching down my card details and buying a new car with the proceeds. But, touch wood, no sneaky shop assistant has yet abused my financial identity, so I'm not convinced it's an extra stage worth having. Unfortunately, that's not a choice I appear to be allowed to make. If I don't sign up to Verified by Visa, I can't complete this purchase. The added security is supposedly for me and not the retailer, but the store won't confirm my transaction unless I accept it. Unless I make every future online purchase more awkward, I can't pay for this one. And something tells me I'm doing them a favour, not the other way round. So I refused. And Foulsham's website refused in return. Damn you, Visa, damn you and your imposed restrictive security system. Looks like my long-standing collection of Old Moore's Almanacks will have a 2009-shaped hole in it. Until I finally submit to Visa's online bullying, I fear my online purchasing days are numbered. These are desperate times. Severe economic decline has slashed the profits of countless UK companies. Customer numbers in our retail heartlands are in freefall. The credit crunch has bitten, and it hurts. The situation is now critical. Many shops are struggling to sell things, especially luxury expensive goods, and their tills are empty. Merchandise that would normally be flying off the shelves is staying resolutely unsold. Store managers have become downcast and dejected, and many of their low-paid staff face imminent redundancy. At this very special time of year, Britons are normally willing to buy anything and everything in the name of consumer commercialism. They head for the shops and rack up enormous debts purchasing novelty gifts, expensive gadgets and party nibbles. But this is not a normal year, and this is not a normal Christmas. The world has entered an era of deep depression, and it's all your fault for not buying stuff. Today the Great British High Street faces a severe shortage of shoppers. Shelves are not being emptied, carrier bags are not being carried, and credit card transactions are at breaking point. Should this desperate situation continue much longer, many much-loved High Street names face certain liquidation. This is a national crisis and no mistake. And it could get much worse. We're only a few weeks from the beginning of the sale season, which usually leads to manic purchasing and snapped-up bargains. But this year an already severe situation has been compounded by continuing cash shortfall. Traditional "25% off" notices have appeared earlier than ever before, several weeks before Christmas Eve, and it's not a pretty sight. The economic future looks bleak. We need to act now. We need to show UK shopworkers that we care. We need to go shopping. And we need to go shopping today. Get involved. Get down to your local High Street and throw some money in their general direction. Dig deep into your pockets. Take out a loan if necessary, but whatever you do don't come back until your arms are heavily laden with produce. Imagine the joy on the faces of the till staff as your VAT-free coppers tinkle loudly into their hands. Remember, there are many exciting, valuable and easy ways to support UK Retail plc. Why not drive to your nearest out of town warehouse and take advantage of all the expenditure opportunities provided? Or log onto your favourite online store and donate large sums of money to their unseen coffers? Or pop round to Canary Wharf and offer your life savings to some needy bankrupt fund manager? Generating additional economic activity such as this is vital to the nation's continued productivity and wellbeing. Give whatever you can afford, and then some. Stretch your credit to bursting point and pledge as much as you're able. Pretend it's an ordinary Christmas and buy things you don't really need and that other people don't really want. Your continued financial sacrifice can help to keep the nation's shareholders afloat. Please buy something today. Every penny counts, and your selfless donation could save a job. Support the shopworkers of Britain today, and together we can make a real difference. At work, I always prefer to take the stairs rather than the lift. to do her make-up, and hoping that nobody spots her. in direct contravention of Health and Safety regulations. stumbled and spilt coffee all over the carpet. from the ground floor and is now regretting it. straighteners and completely blocking the stairwell. with an unseen boyfriend via her mobile. hoping that nobody goes into the smelly cubicle too soon afterwards. passer-by with a sheaf of billowing project notes. piled high with paper towels, loo roll and disinfectant. be at school, busy texting his beardykid mates. and now can't beep herself back into the office. first time, and now you're wondering which floor they work on. tell three colleagues they're being made redundant. her private life whilst gossipping loudly on her mobile. to eat a box of greasy fried chicken at his desk. coffee-based rendezvous with Katie from Admin. watching out for intruders who are never ever there. for his 7th cigarette break of the day. passing elated worker exiting the building.